A cute Santa emerging from a chimney with candy canes cleverly hides an air freshener in this great holiday craft project. 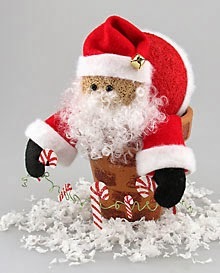 Embellishments like a jingle bell on Santa's hat and wax "snow" really make this Santa special. Plastic or flat wooden candy cane shapes, two 3/4" and three 1-3/4"
Cut 1/2" x 1-1/4" rectangle from sponge. Use sponge to paint brown "bricks" onto pot as shown. Dip sponge into paint, press onto palette to remove excess, and then press onto pot. Let dry. Thin small amount brown paint with water. Dip toothbrush into paint and spatter paint pot by running thumbnail across bristles; let dry. Note: Practice spattering technique on paper towels first. Open air freshener and place in pot. Wax serrated knife with candle stub or paraffin. Cut 2-1/4"-diameter circle from bottom of 4" foam ball; discard scrap. Use spoon to carve out foam from inside ball, until it fits over top of air freshener. Remove ball and paint it red for body; let dry. Cut small foam ball in half; reserve one half for a future project. Slightly shape flat side of half-ball (head) to fit around body. Paint head fleshtone; let dry. From white plush felt, cut one 3/4" x 10-1/2" strip (belt), one 3/4" x 7" strip (hat), and two 3/4" x 5-1/4" strips (cuffs). Beginning and ending at opening, wrap and glue 10-1/2" plush felt strip around body with one long edge aligned with center of ball. Larger area above belt is upper body. Replace body over air freshener. Cut patterns from felt as indicated. Roll and glue hat piece into cone shape, with long edges slightly overlapping. Repeat for each sleeve. Glue cuffs around bottoms of sleeves, aligning raw edges. Glue mittens inside sleeve openings as shown, thumbs facing each other. Glue bell to tip of hat and place hat on head, leaving most of face exposed. Glue white trim around hat, aligning raw edges. For eyes, glue flat side of beads to face. Place head on body. When pleased with position, glue head to body with hat sandwiched between. Glue doll hair to face for beard. Glue tip of hat to one side as shown. Position and glue sleeves to inside of pot on each side of face.